Pony Leatigaga, left, and Luke Reynolds of Diamond Head Grill prepare for "Oahu Dines." If you're planning to eat out this week, Wednesday's a good day. 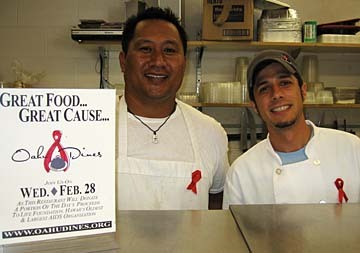 During "Oahu Dines," 19 restaurants have committed to donating at least 20 percent of their sales that day to the Life Foundation, which will use the money to combat HIV and AIDS in Hawaii and throughout the Pacific. Participating are 12th Avenue Grill, A Taste of New York, JJ Bistro & French Pastry, Baci Bistro, Boots & Kimo's Homestyle Kitchen, Cinnamon's, Brasserie du Vin, Soul de Cuba Café, Chai's Island Bistro, Dee Thai, India Cafe, Diamond Head Market and Grill, Hapa Grill, Le Guignol, Spices, Los Chaparros and the Wedding Cafe, Ben & Jerry's and Big City Diner at Ward Centre. If you'd rather stay home, the Life Foundation has ribbons and invitations you can use to throw a "Dine-In" party, or bid on cooking lessons and restaurant certificates at www.oahudines.org. Don Ho's Island Grill celebrates the leap year with a Sadie Hawkins cocktail -- free to any guy escorted by a gal on Friday. Created just for the once-every-four-years date night is a Red Appletini with vodka, red apple liquor and a splash of sweet and sour. Lunch and dinner specials are also on the menu, and Molokai Jazz West performs from 5:30 to 8:30 p.m.
Don Ho's is in the Aloha Tower Marketplace. Call 528-0807. Kapolei High School presents its 3rd Annual Art Exhibition March 1 to much fanfare. There will be live bands, fashion shows, even keiki games and crafts. But the focus will be on student art. The school will hold walk-through tours of the show, which centers on sustainability. Expect to see paintings, drawings, photography, sculpture and video and computer art. Festivities begin at 3 p.m. at the school and continue through 5 p.m.